It's a shame I won't be home when Glee (as well as BBT, HIMYM, Chuck and Modern Family) premieres. But it's alright, I can always download it when I get back. I'm excited! Not really so much because a Filipino will be on it (yay for that!) but simply because it's a new season. This one I will totally dig me thinks: Brittany vs Britney. Wonder how Brittany will fare, it'll be hilarious for sure! New guests and from what I've been seeing from promo videos, new characters. This will be a very interesting new season indeed. I did not get the promo vid where Charice Pempengco was in basically because I don't like the 2 girls talking before getting on the preview itself haha. 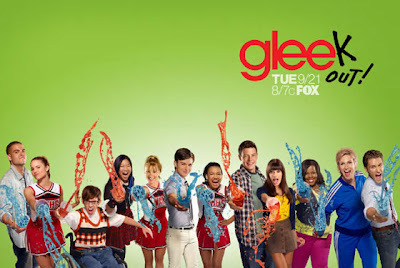 Glee promo poster and photo courtesy of nymag and spoilersguide.com respectively.